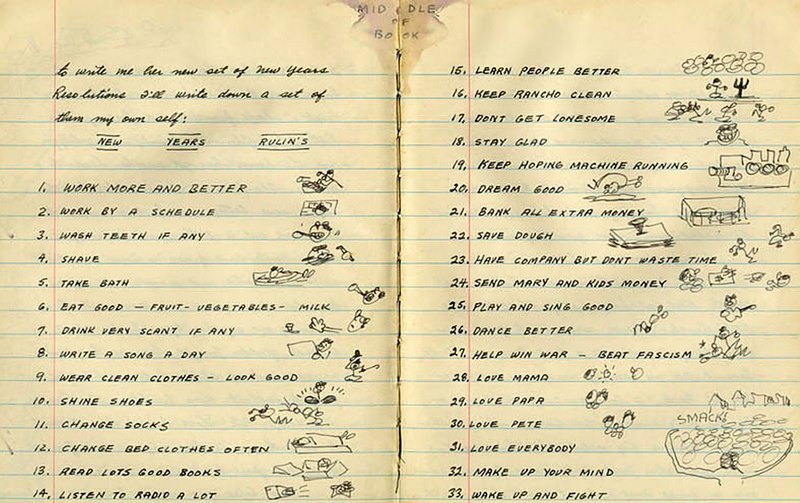 On January 1, 1943, the American folk music legend Woody Guthrie jotted in his journal a list of 33 “New Years Rulin's." Nowadays, we'd call them New Year's Resolutions. Adorned by doodles, the list is down to earth by any measure. Family, song, taking a political stand, personal hygiene -- they're the values or aspirations that top his list. You can click the image above to view the list in a larger format. Below, we have provided a transcript of Guthrie's Rulin's. We wish you all a happy 2018. Note: This fine list originally appeared on our site back in 2014.